How did you first get involved with miniatures? I have always loved little things. Whenever my parents traveled, they brought back things for me—always under 3 inches or so—because they knew I loved miniatures. Growing up, I had a miniature Block House secretary desk with a cabinet over it. I still have it today. 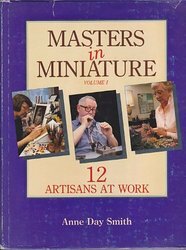 When and how did you begin writing about miniatures?